In the wake of Russia’s annexation of Ukraine’s Crimea region, public concern about Russia has increased, according to a new Pew Research Center survey. Even so, when given the choice, more describe Russia as a serious problem but not an adversary (43%) than say it represents an adversary (26%). Just 22% say Russia is not much of a problem. Since last November, the percentage viewing Russia as an adversary has risen eight points (from 18%) while the share saying it is a serious problem has increased seven points (from 36%). The number of Americans who do not think of Russia as much of a problem has fallen by almost half – from 40% then to 22% today. Most of the increase in the view that Russia is an adversary has come among Republicans. 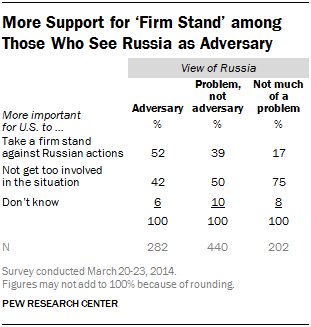 Currently, 42% of Republicans describe Russia as an adversary, up from 24% four months ago. Just 23% of independents and 19% of Democrats view Russia as an adversary, little changed from November. But increasing numbers of Democrats and independents describe Russia as at least a serious problem. The new national survey by the Pew Research Center, conducted March 20-23 among 1,002 adults, finds continued public reluctance about getting too involved in Ukraine. About half (52%) say it is more important for the United States not to get too involved in the situation in Ukraine while 35% say it is more important for the U.S. to take a firm stand against Russian actions. Opinions have changed only modestly since early March, before Russia annexed Crimea. At that time, 56% said it was more important not to get too involved and 29% favored a firm stand against Russia. The public gives President Obama mixed ratings for his handling of the situation involving Russia and Ukraine. Overall, 43% say Barack Obama is handling the situation between Russia and Ukraine about right, while 35% say he is not being tough enough and just 5% say he is being too tough. 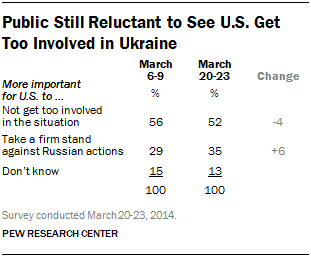 Views of Obama’s handling of the Ukraine situation are highly partisan. Most Republicans say he is not being tough enough (58%), while just 27% say he is handling the situation about right. Opinion is the reverse among Democrats: 65% say Obama is handling the situation involving Russia and Ukraine about right, compared with 22% who say he is not being tough enough. Among independents, 42% say he is handling things about right, while 35% say he is not being tough enough. 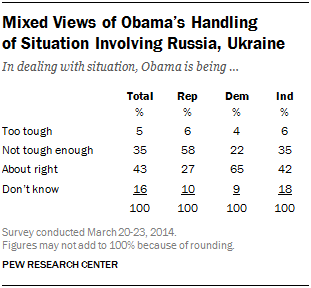 Across all partisan groups, very few say that Obama has been too tough in handling the situation. In the Pew Research Center’s major foreign policy study last November, far more Americans said Obama was not tough enough in his general handling of the nation’s foreign policy and national security than say that today about his handling of Russia and Ukraine. At that time (the survey was conducted Oct. 30-Nov. 6), 51% said Obama was not tough enough “in his approach to foreign policy and national security issues.” That is 16 points higher than the percentage making that judgment today about Obama’s handling of the situation involving Russia and Ukraine. There is no greater appetite for a military approach to address the situation between Russia and Ukraine than there was two weeks ago. Among the 35% of the public that thinks it is more important for the U.S. to take a firm stand against Russian actions, very few (just 6% of the public overall) say military options should be considered. By comparison, 26% of the public supports a firm stand against Russia and say only economic and political measures should be considered. This is little changed from two weeks ago, when 8% said that military options should be on the table. About as many Republicans say it is more important for the U.S. to take a firm stand against Russian actions (45%) as to not get too involved in the situation (47%). Democrats and independents say it is more important for the U.S. to not get too involved in the situation than to take a firm stand against Russian actions (56%-35% among Democrats, 56%-32% among independents). 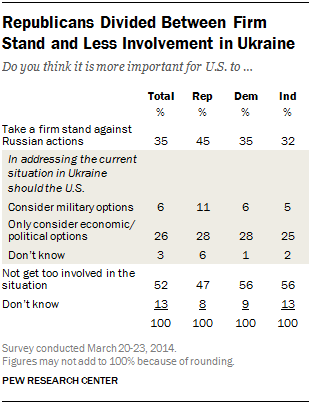 Few Republicans (11%), Democrats (6%) or independents (5%) say a military approach should be considered in addressing the situation in Ukraine. As tensions over Ukraine persist, the public now sees Russia as a greater concern than China – a first in Pew Research surveys dating to 2008. 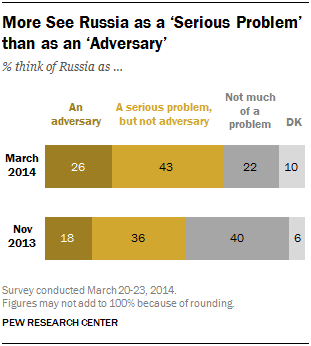 Overall, 68% call Russia an adversary (26%) or a serious problem but not an adversary (43%). 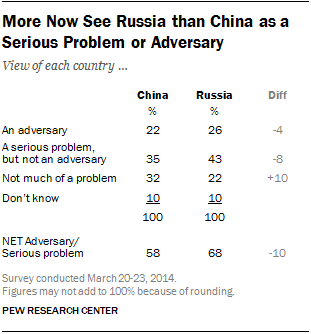 By comparison, 58% say that China is an adversary (22%) or a serious problem but not an adversary (35%). This marks a shift in views from November, when 66% said China was an adversary or a serious problem but not an adversary, compared with 54% who viewed Russia this way. Even in the fall of 2008, just weeks after fighting between Russian and Georgian forces, about as many saw China as a serious problem or adversary (68%) as felt this way about Russia (66%). Republicans have become much more likely to view Russia as an adversary over the past four months. In the current survey, 42% of Republicans think of Russia this way, compared with just 24% who said this in November 2013. By comparison, just 23% of independents and 19% of Democrats call Russia an adversary and these views have shown much less change than those of Republicans over recent months (+6 points among independents, +4 points among Democrats). Those with at least some college experience also have become more likely to view Russia as an adversary. In November, 21% of college graduates and 17% of these with some college experience saw Russia as an adversary; today, 32% and 28%, respectively, say Russia is an adversary. Among those with no college experience, 20% call Russia an adversary, compared with 16% who said this in November. Among the 26% of the public that views Russia as an adversary, about half (52%) say it is more important for the U.S. to take a firm stand against Russian actions, while 42% say it is more important that the U.S. not get too involved in the situation involving Russia and Ukraine. Among those who view Russia as a serious problem but not an adversary (43% of the public), 50% say it is more important for the U.S. not to get too involved in the situation while 39% supports taking a firm stand against Russia. Those who do not see Russia as much of a problem (22% of the public) overwhelmingly prefer that the U.S. not get too involved (75%).